ຢູ່​ໃນ​ງານມອບ​ລາງວັນ​ດີ​ເດັ່ນ ແກ​ຣມ​ມີ (Grammy) ປີ​ກາຍນີ້ ຫົວ​ໜ້າ​ບໍ​ລິ​ຫານ ຫລື CEO ຂອງ​ອົງ​ການ​ໃຫ້​ລາງວັນ​ດ້ານ​ການ​ບັນ​ທຶກສຽງ​ເພັງ, ທ່ານ ນີ​ລ ພອດ​ນາວ (Neil Portnow) ກ່າ​ວ​ວ່າ ຜູ້​ຍິງ​ຕ້ອງ​ໄດ້ "ກ້າວ​ຂຶ້ນ​ໄປ" ເມື່ອ​ທ່ານ​ຖືກ​ຖາມ​ວ່າ ເປັນ​ຫຍັງບໍ່​ມີ​ຜູ້​ຍິງຖືກ​ແຕ່ງ​ຕັ້ງ​ໃຫ້​ໄດ້​ຮັບ​ລາງວັນ​ປະ​ເພດ​ສູງ​ສຸດນີ້. ໃນ​ເວ​ລາ​ຕໍ່​ມາ ທ່ານກໍ​ຕ້ອງ​ໄດ້​ຮັບ​ຮູ້ວ່າ ທ່ານ​ໃຊ້​ຄຳ​ເວົ້າ​ບໍ່​ຖືກຕ້ອງ. ໃນ​ຕອນຄ່ຳ​ຄືນທີ່​ນະ​ຄອນລອ​ສ ແອນ​ເຈີ​ແລັ​ສ (Los Angeles) ຂອງ​ວັນ​ອາ​ທິດ​ວານນີ້ ແມ່ນເລີ້ມ​ຕົ້ນ​ຂຶ້ນ​ໂດຍ​ການ​ໄປ​ປາ​ກົດ​ໂຕຂອງ​ທ່ານ​ນາງ ມີ​ແຊ​ລ ໂອ​ບາ​ມາ ແບບບໍ່​ຄາດ​ຝັນ. ໂດຍ​ທີ່​ຢືນ​ຢູ່​ກັບ​ນາງ Jennifer Lopez, Lady Gaga, Jada Pinkett Smith ແລະ ນາງ Alicia Keyes, ອະ​ດີດ​ສະ​ຕີ​ໝາຍ​ເລກ​ນຶ່ງ ໄດ້​ກ່າວ​ຕໍ່​ບັນ​ດາ​ທ່ານ​ຜູ້​ຊົມ​ໃຫ້​ຮູ້​ວ່າ ດົນ​ຕີ​ມີ​ຄວາມ​ໝາຍ​ແນວ​ໃດ​ຕໍ່​ທ່ານ​ນາງ. ທ່ານ​ນາງໂອ​ບາ​ມາ​ເວົ້າ​ວ່າ "ນັບ​ແຕ່​ແ​ຜ່ນສຽງ​ໂມ​ທາວ (Motown) ທີ່​ຂ້າ​ພະ​ເຈົ້າຫລິ້ນ​ຈົນ​ເກົ່າ ຢູ່​ເຂດ​ພາກ​ໃຕ້ຈົນ​ເຖິງ​ເພັງ 'Who Run the World' ທີ່​ໄດ້​ເຮັດ​ໃຫ້​ຂ້າ​ພະ​ເຈົ້າ​ຮູ້​ສຶກ​ລື້ນ​ເລີງ​ຢູ່​ຕະ​ຫລອດ​ທົດ​ສະ​ວັດ​ຜ່ານ​ມານີ້, ສຽງ​ເພງ​ລ້ວນ​ແລ້ວແຕ່​ໄດ້​ຊ່ວຍ​ຂ້າ​ພະ​ເຈົ້າໃຫ້ສາ​ມາດ​ເລົ່າ​ເລື້ອງ​ລາວ​ຂອງ​ຕົນໄດ້.” ​ທ່ານ​ນາງ​ກ່າວ​ຕໍ່​ໄປ​ວ່າ “ບໍ່​ວ່າພວກ​ເຮົາ​ ຈະ​ມັກ​ເພງ​ປະ​ເທດ​ລູກ​ທົ່ງ ຫລື ແບບ​ແຣບ ຫລື​ແບບ​ຣັອກກໍ​ຕາມ, ສຽງ​ເພງ​ລ້ວນ​ແຕ່​ຊ່ວຍ​ໃຫ້​ພວກ​ເຮົາ​ມີ​ຄວາມ​ຮູ້​ສຶກ​ຕໍ່​ຕົນ​ເອງ​, ມີ​ກຽດ​ສັກ​ສີ, ແລະ​ມີ​ຄວາມ​ເສຍ​ໃຈ ແລະ​ມີ​ຄວາມ​ຫວັງ ແລະ​ມ່ວນ​ຊື່ນ​ນຳ​ກັນ." ສ່ວນ​ນາງ Keyes ທີ່​ປາ​ກົດ​ວ່າຍັງ​ສືບ​ຕໍ່​ເຮັດ​ຕາມ​ຄຳ​ຕັດ​ສິນ​ໃຈ​ຂອງ​ຕົນບໍ່ໃຊ້​ເຄື່ອງ​ສຳ​ອາງແຕ່ງ​ໜ້າຕໍ່​ໄປ ເປັນ​ໂຄ​ສົກ​ຈັດ​ລາຍ​ການ​ຂອງ​ງານມອບ​ລາງວັນ ແກ​ຣມ​ມີ (Grammy) ປະ​ຈຳ​ປີຄັ້ງ​ທີ 61 ໃນ​ວັນ​ອາ​ທິດ​ວານນີ້, ທີ່ຈັດ​ເພື່ອ​ເປັນ​ການ​ໃຫ້​ກຽດ​ແກ່​ເພງ​ທີ່​ດີ​ເດັ່ນ​ທີ່​ສຸດນີ້. ​ງານມອບ​ລາງວັນ Grammys ປີ​ນີ້ ​ຍັງ​ໄດ້​ໃຫ້​ກຽດ​ແກ່ນັກ​ຮ້ອງ​ເພງ​ອາ​ເມ​ຣິ​ກັນ​ອຳ​ມະ​ຕະທີ່ດີ​ເດັ່ນ​ ຊຶ່ງ​ກໍ​ຄື ​ທ່ານນາງ Diana Ross ແລະ​ທ່ານນາງ Dolly Parton ອີກ​ດ້ວຍ. ທ່ານນາງ Ross ໄດ້​ຖືກ​ນຳ​ສະເໜີ​ໂດຍ​ຫລານ​ຊາຍ​ອາ​ຍຸ 9 ປີ​ຂອງ​ເພິ່ນ. ໂດຍ​ທີ່​ຢູ່​ໃນ​ຊຸດສີ​ແດງ​ຍາວ ແລະໃຫຍ່ ທ່ານ​ນາງ Ross ໄດ້​ຮ້ອງ​ເພງ​ຂອງ​ຕົນ​ຫລາຍໆ​ເພງ, ຮ້ອງ​ບາງ​ເພງ​ໃນ​ຂະ​ນະ​ທີ່​ນາງ​ຍ່າງ​ຜ່ານ​ບັນ​ດາ​ຜູ້​ຊົມ​ໄປ. ໃນ​ເວ​ລາ​ຕໍ່​ມາ ຕອນ​ທີ່ທ່ານ​ນາງ​ສະ​ແດງ​ຢູ່ນັ້ນ, ນັກ​ຮ້ອງ​ທີ່​ໂດ່ງ​ດັງທ່ານ​ນີ້​ເວົ້າ​ວ່າ "ຂອບໃຈ​ບັນ​ດາ​ທ່ານ​ຫລາຍໆ ທີ່​ມີ​ຮ່ວມ​ງານນີ້ ແລະ​ມາຮ່ວມ​ສະ​ຫລອງວັນ​ເກີດ​ຄົບ​ຮອບ 75 ປີ​ຂອງ​ຂ້າ​ພະ​ເຈົ້າ." This year's Grammys seemed to be all about women. At last year's Grammys, Recording Academy CEO Neil Portnow said women need to "step up" when asked about the lack of women nominated in the top categories. He was later forced to acknowledge his poor choice of words. The evening in Los Angeles began Sunday with a surprise appearance by Michelle Obama. Along with Jennifer Lopez, Lady Gaga, Jada Pinkett Smith and Alicia Keyes, the former first lady told the audience what music meant to her. "From the Motown records I wore out on the Southside to the 'Who Run the World' songs that fueled me through this last decade, music has always helped me tell my story" Obama said. Whether we like country or rap or rock, music helps us share ourselves, our dignity and sorrows, our hopes and joys." 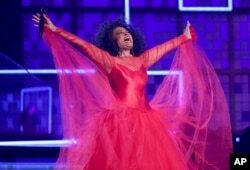 Keyes, who seemed to remain true to her decision to stop wearing makeup, was the host of Sunday's 61st annual Grammy Awards, honoring the year's best music. Camilo Cabello kicked the show off with her hit "Havana." Ricky Martin, Young Thug and and J Balvin joined her on stage. This year the Grammys also honored two legendary American music icons -- Diana Ross and Dolly Parton. Ross was introduced by her nine-year-old grandson. Dressed in a voluminous red gown, Ross sang several of her songs, some of them as she walked through the audience. Later during her performance, the iconic singer said, "Thank you for being here and celebrating my 75th birthday." Miley Cyrus sang to her godmother Dolly Parton as part of the tribute to the country music superstar. Cyrus was joined by Kacey Musgraves and Katy Perry to sing Parton's "Here You Come Again." Parton and Cyrus also sang "Jolene." Musgraves' "Golden Hour" won Album of the year. The brash Cardi B. was in tears when she accepted the Grammy for best rap album for her "Invasion of Privacy." It was the first time a woman has won the category. Lady Gaga won best pop solo for "Joanne (Where Do You Think You're Goin'?). Gaga and Bradley Cooper won best pop duo/group performance for "Shallow." Ariana Grande won best pop vocal album, for "Sweetener," but she was not in attendance after a public disagreement with the show's producer about performing Sunday night. Dua Lipa earned best new artist prize. H.E.R. took home the best rhythm and blues album award for H.E.R. H.E.R. and Daniel Caesar won best rhythm and blues performance for "Best Part." "Butterflies" by Musgraves won best country solo.